Maternity ward nurses are almost always present if you give birth in a hospital and sometimes if you give birth at a birthing center or midwifery clinic. Following are the basics about what you can expect (and not expect) from your nurse during the labor and the birth of your baby. While all nurses are different - after all they're all people with different personalities - there are commonalities because of their basic job description. A maternity ward nurse, like all nurses, has gone through some sort of training process to become a nurse. In earlier years, nurses were trained through mentoring programs or by working their way up in a care setting. However, today this is rare. If you have a maternity nurse, it's almost guaranteed that she or he has gone through a two-year associates degree program or more likely a four-year long BSN. After going through college, all nurses must pass their nursing boards before working with patients full-time. All of the above means that you are in good hands with your nurse. In fact, in a hospital, nurses on the maternity ward will probably be much more valuable to you than your delivering doctor or midwife. Helping to figure out if you're in labor or false labor. If you are in false labor, your nurse will likely send you home. If you're in labor, your nurse will be able to help you figure out how far along you are by your labor symptoms. This can include items like checking your cervix to see how dilated you are, counting contractions, and looking at your overall appearance. Helping you to get settled into your room once you arrive at the hospital. Taking your first vitals and all your vitals for the remainder of your stay. Vitals include items like blood pressure and pulse. Making periodic checks on your baby while you're in labor like using a Doppler or fetal monitor (external or internal). Administering both induction medication and pain medication (including IVs), although epidurals are not. An epidural must be given by a trained anesthetist. Assisting the doctor or midwife who delivers your baby. This means helping you to prep for the actual birth, helping you to stay cool while you're giving birth, and helping you to hold your baby after the birth. Taking your baby's apgar score, weighing, and checking out your baby is something your maternity nurse is likely to do. Helping you to clean up after the birth, checking your after-birth vitals, fluid intake, and output. If you stay on the maternity ward after giving birth (not all hospitals move you), your nurse is usually the person who helps you do basic baby tasks and can help you to breastfeed. Before you leave the hospital, she is usually the person who acts as a witness when you sign paternity papers and birth certificate forms. Notice the "less likely" part of the title above. The following are tasks that may be done by maternity nurses even though these tasks are not actually under their job description. Deliver your baby. The unexpected can and does occur in hospitals, but in most cases a doctor or midwife will deliver your baby. Your nurse will still be there to offer both you and the delivering party support. 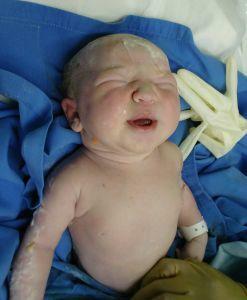 Nurses never perform C-sections (Cesarean sections) or other surgical procedures. Provide labor coach services. While many maternity nurses do offer lots of coaching and one-on-one support during labor, that's not exactly what they are there for. Additionally, nurses have more than one patient at a time and a good labor coach will be with the woman in labor the whole time as needed. Don't expect to rely on your nurse to act as your labor coach. Your partner can serve this purpose and another excellent option whether you have a partner or not would be to look into hiring a birth doula. Most maternity ward nurses are competent, helpful, and kind. However, like all people their personalities and skill levels vary. You may end up with a nurse who is disrespectful of your labor choices. This is the only birth of this child you'll be having, so you want it to go as well as possible. If your nurse is adding stress and arguing with you, you can ask for another nurse. In rare occasions, hospitals won't have the resources to allow a change because of lack of staff, but overall you do have a choice. If you really have trouble with a maternity nurse, it's also fine to file a complaint with the hospital or clinic. Something about hospitals that most people don't know is that nurses do a bulk of the work. From prep work, lab work, basic patient care, and passing out medications, nurses do it all. Doctors get more glory, but follow a nurse around one day and a doctor the next and you'll see who is really running the hospital. Additionally, you can expect your maternity ward nurse can have anywhere from one to ten-plus patients. If you get an especially great nurse, one who goes out of her way for you and really helps your labor and birth go smoothly, it's always a nice idea to send a thank you note. One thing nurses really enjoy is when you also send the thank you note to their supervisor.